The new Sacramento Kings Golden 1 Center seats 17,500. The modern arena features five bifold, strap latch main entrance doors made of a combination of steel and aluminum frames, with clear openings of 10 and 9 m (32 and 28.8 ft). 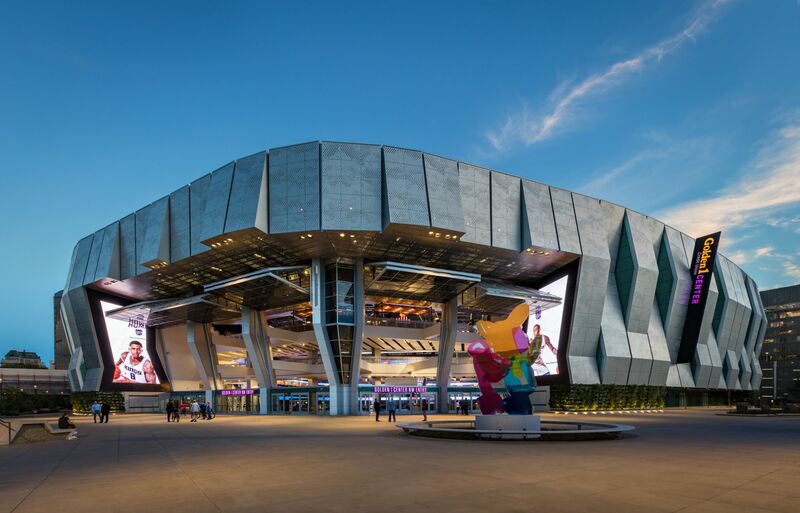 While Sacramento Kings fans celebrate winning basketball games at the city’s new arena, the Golden 1 Center, design/construction professionals can get excited about something else: the facility’s doors. Made of low-emissivity (low-e), safety-laminated glass installed by Bagatelos Architectural Glass Systems, they weigh approximately 12,700 kg (28,000 lb) each. Three of them measure 9 x 12 m (29 x 41 ft), while the other two are 101 mm (4 in.) wider. Rob Rothblatt, design principal architect of Aecom Architecture, says the doors are highly innovative, unique installations. This 11-degree angle is implemented on three of the five entrance doors, for shading and reflectivity reduction. Each of the bifold strap latch doors are lifted by a trio of 5-horsepower motors requiring 480V, three-phase, 50-amp electrical power, and feature liftstraps double the normal width. On the second-story plaza, visitors to the stadium can look through the bifold glass doors to the city outside. The doors are glazed with small fritted glass and low-emissivity (low-e), safety-laminated, gray-glass non-reflective panels to prevent birds from flying into them. This ‘inside-outside’ quality was crucial during the design and construction process, as it reflects the character of Sacramento. The arena had to work well with the area’s climate, incorporate indoor and outdoor elements, and stand up to the rigorous standards of California’s Title 24. For instance, the bifold doors allow for natural cooling of the structure, ventilating the breeze through small vents under the arena’s 17,500 seats. 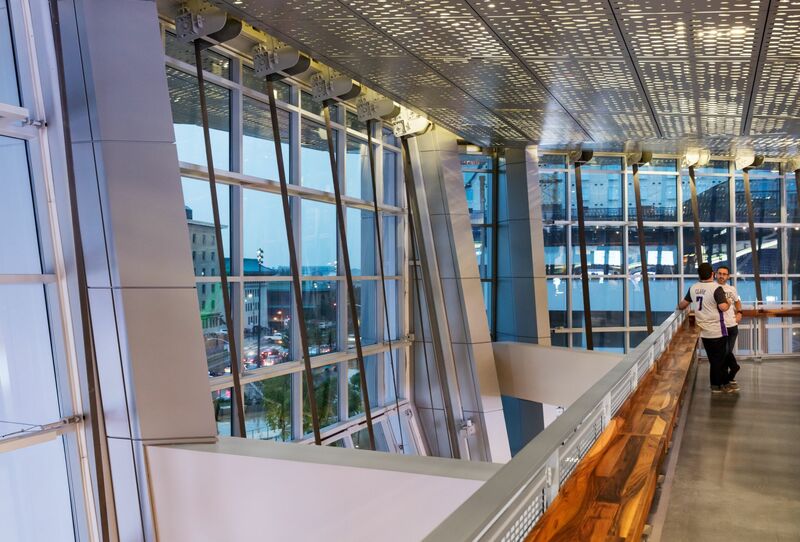 Not only is the Golden 1 Center the first indoor venue to receive Platinum under the Leadership in Energy and Environmental Design (LEED) program, it is also the first professional sports venue to be completely powered by solar energy. 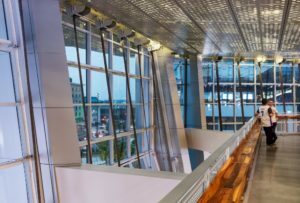 Also contributing to its energy-efficient designation is the building’s water usage—the center should save about 3.7 million L (1 million gal) of water each year compared to a typical similar facility. Each of the bifold canopy hangar-style doors weighs in at about 12,700 kg (28,000 lb) and is lifted by three 5-horsepower motors. The liftstraps are 152 mm (6 in.) wide. The team has also begun holding practices with the doors open (creating the indoor-outdoor melding Rothblatt describes) to gauge the potential for holding a game in this environment and to see what conditions will need to be met to match the temperature, humidity, and wind of an indoor arena. Extensive testing was completed prior to installation to ensure the doors would work safely and correctly, with the first piece being tested over a few months. This emphasis on safety was further supported by Bill Schmidt Construction, which completed the three-month door installation despite the various challenges posed by the design. Approximately 4000 construction workers (e.g. sheet metal installers, electricians, and plumbers) participated in the erection of the facility, which was also part of a $1-billion development project including 139,354 m2 (1.5 million sf) of mixed-use property. The center also includes technological features that have become fairly standard in modern arenas, such as apps for ordering food and watching replays, giant screens, and high-speed Internet. 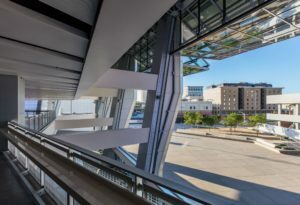 The Golden 1 Center opened near the end of 2016, and will give attendees of concerts and conventions as well as sporting events the chance to walk through its complex doors.